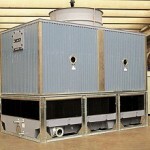 Sol-Tech srl Solution Technology can provide a wide range of evaporation cooling towers, both package towers and customized solutions, for different industrial processes and using different technical solutions thanks to their long-standing experience. 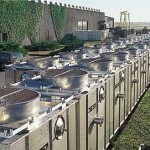 Here are a few evaporation towers and systems we have on offer. Axial induced open circuit towers, of the bolted variety, with varnished Carbon Steel panels or Galvanized Carbon steel frames with fibreglass panels and tanks. 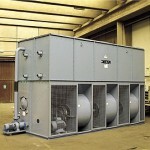 Closed circuit towers of the bolted variety, with varnished Carbon Steel panels and axial or centrifugal fans and Galvanized Carbon Steel or Stainless Steel exchangers. 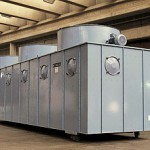 Closed circuit coolers or condensers of the bolted variety, with varnished Carbon Steel panels and axial or centrifugal fans and Galvanized Carbon Steel or Stainless Steel exchangers. 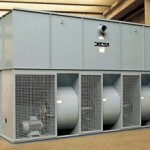 Sol-Tech srl Solution Technology also offers solutions with axial fans which reach sound levels of -12 dBA compared to normal fans. A careful assessment of the industrial process for which the evaporation towers are required in order to design and build the most suitable tower for every kind of process. Great flexibility in the choice and composition of the technical specifications of the systems. Experience in different sectors, including nuclear reactors. 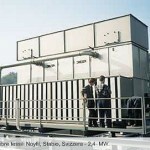 Great attention is paid to the dynamics and the processing of air and water in the systems, depending on the type of evaporation tower chosen. The possibility of exploiting our help services for water processing, revamping, regeneration of existing cooling towers and the enhancement and the supply of components parts. If you are interested in our evaporation cooling tower offers, please get in touch with us by using the form contact us or by calling us at 348 6925260,02.70058433.